We are proud to say that we have a 40-year history supplying mobility aids to anyone in our community who is struggling with infirmity or disability. This service is made possible by the generosity of local people who’ve donated their 3- and 4-wheel walkers, Zimmer frames and mobility scooters to The Pigs, to help others who might be in similar situations. The Alresford Pigs work closely with the Giles Group (www.gilesgroup.org.uk), and the Alresford Community Centre, to reach out to anyone with mobility issues, to get them the aids that could possibly help. Plus the Pigs keep a stock of such aids that have been donated – wheelchairs, crutches, Zimmer frames, 3- and 4-wheel Rollators, as well as the powered mobility scooters – for offering to anyone who needs a little help. Many of these are even used on a temporary basis after younger residents have been involved in skiing, snow-boarding or ladder accidents, in return for a donation, of course! Hampshire County Council have decided, by committee, that no crutches or similar left at the waste tip can be bought or recycled into the community, because of the potential insurance claim that might result if one failed, and it was deemed to be their fault. Similarly the NHS do not recycle such equipment, it all goes to scrap, so they do not have to clean/inspect/check them. The Red Cross used to check and reissue such things, but they have closed down their centre in Winchester. The Pigs are asked more and more often to provide these aids to local residents, who have had accidents or operations, and we are having trouble getting replacement equipment. Instead of people taking these old ones, or even their new units to the dump, please call us! We will collect them, or maybe they could deliver them to the Mens Shed in Alresford! We do not claim to be experts, but all crutches and frames are checked, and if they were in some way defective, we would not issue them to our community. 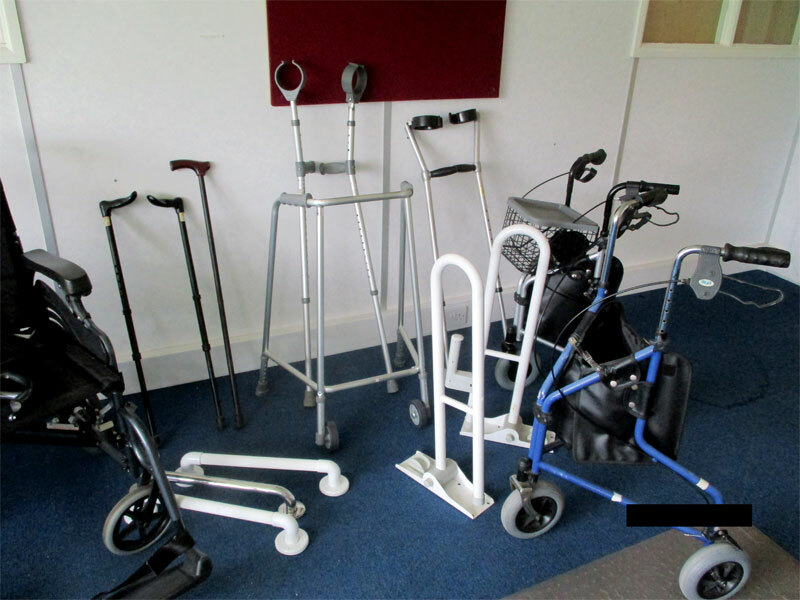 Our stock of mobility aids is held at the Alresford Men’s Shed, (www.alresfordmensshed.org.uk) at the top of the Dean in Alresford, so if you need something, or want to see one of these units to decide whether to try it, please visit the Shed, or contact the Alresford Pigs via phone or email.